Have you ever heard of the DXDIAG? Do you know what it's look like and where it is located or how to activate this free software? This free software is one of the most ignored software or unknown software tool in windows system. If your ask an a person regarding this tool, chances are you'll get a mixed reactions in there faces. In the first place why is it there if no one ever used it or cared to know more about this free tool. Well for one the content of this tool can be pretty intimidating to most user who does not have enough technical background. First how do we activate this tool to know what inside our computer. To activate this tool please see picture below. 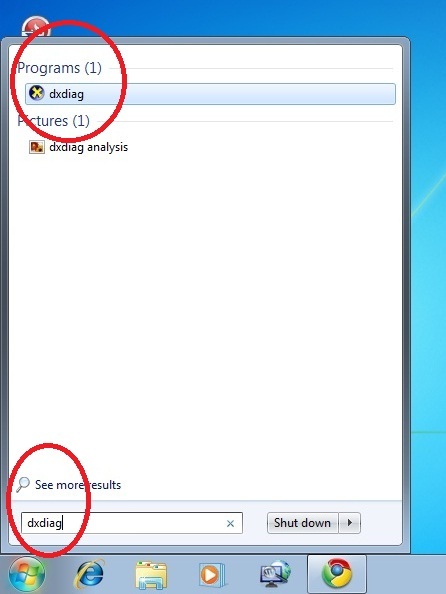 To activate the DXDIAG tool press the start button then on the search bar type the word dxdiag and hit the enter key. 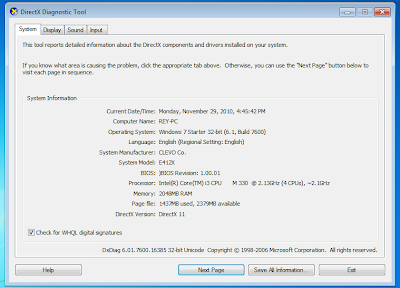 The picture below will appear, but if it is your first time to activate this tool a question will appear first to ask you whether to allow dxdiag to check for digitally sign driver. Just press the YES button to continue loading the DXDIAG tool which should look like the picture below. Notice there are several tab to this tool, they are the system, display, sound and input tab. Clicking on each tab will display there content. The first tab is contains the most common information about your current computer system, the hardware and the software. 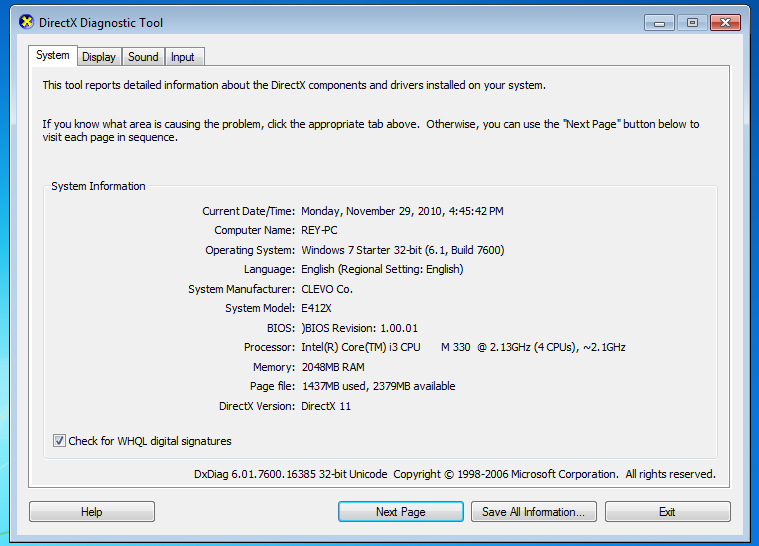 As you can see from the picture above the computer name, operating system, language, system manufacturer, system model, BIOS, processor, memory page file and the direct X version are all listed here. You may ask, So what I'm i going to used this for. Well this figure and data may not be useful to an average person but to a technical support person, this is valuable information. This first tab indicate how many memory are installed into your system, what type of processor is there and most of all the computer model is indicated. Which should be useful for warranty information if you system is new and what to verify it's content of the manufacturer's websites or on the vendor's website. This tool can help you verify if the vendor is telling the truth regarding the machine he or she is selling. Remember to access the tool just go to the start button and on the search bar type the word DXDIAG and press the enter key to activate the free software tool. I really enjoyed your post and I am now interested in reading some more of your posts on your blog and see what you have to say. Do you mind if I tweet your blog post out to my followers on twitter? I think they would also enjoy the blog post. Thanks. Thanks for the post. You are always very informative and easy to follow. Didn't know about this tool before. Thanks.